The T-54 and T-55 tanks are a series of Soviet main battle tanks introduced just as the Second World War ended. The first T-54 prototype was completed at Nizhny Tagil by the end of 1945. Initial production ramp up settled for 1947 at Nizhny Tagil, and 1948 for Kharkov were halted and curtailed as many problems were uncovered; the T-34-85 still accounted for 88 percent of production through the 50's. 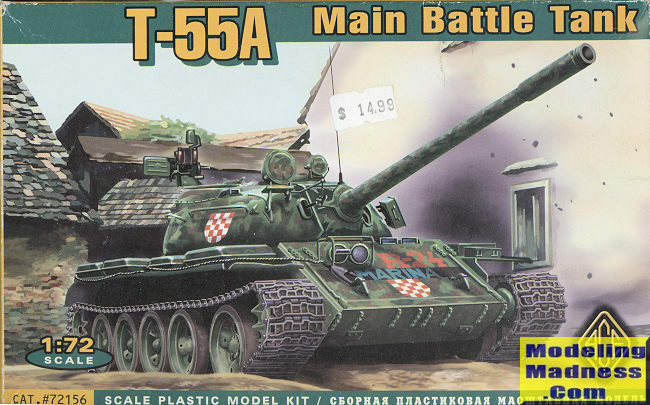 The T-54 eventually became the main tank for armoured units of the Soviet Army, armies of the Warsaw Pact countries, and many others. T-54s and T-55s have been involved in many of the world's armed conflicts since the later part of the 20th century. The T-55A differed from the base T-55 in several ways. In 1961, development of improved NBC protection systems began. The goal was to protect the crew from fast neutrons; adequate protection against gamma radiation was provided by the thick armour and a PAZ basic NBC protection system. Such were the numbers built and exported that many tanks were upgraded in a variety of ways to keep them as useful weapons. They have been used in countless conflicts and are still on active service with a number of nations' armies. I think that most would agree that Ace kits are short run. While the detailing is fairly nicely done, the large sprues and thick attachment points along with the proclivity towards ejector pin marks, sink areas, and large mold seams keeps them out of the mainstream kit maker category. This one has a bag bulging with white, off-white and light tan sprues. There is no photo etch. All of the parts will need cleanup prior to use and in some cases, mold shift makes fine bits unusable. Typical for these sorts of kits, the main hull is comprised of a floor plate and separate side, front and rear pieces. The upper hull is in one piece. There are separate suspension pieces to attach to the hull as well as the five paired road wheels on either side. There is a fairly nice idler and sprocket. No return rollers to worry about as these tanks did not have them so you will have a sagging upper track link. 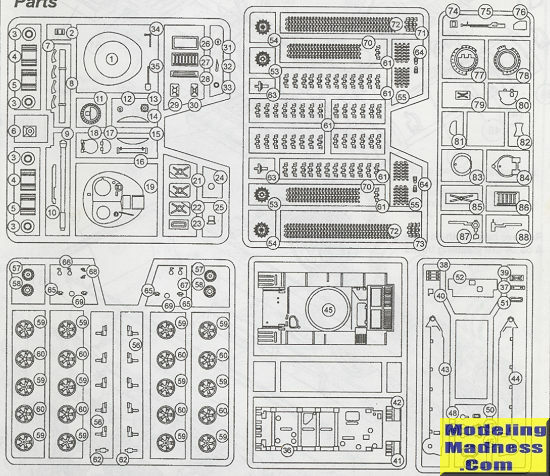 The tracks themselves are link and length and it will take a bit of deciphering what part goes where as the smallish instruction sheet does not dedicate a drawing for this feature. A lot of pieces go atop the turret and thanks to the well drawn, but rather busy instruction drawings, you can pretty well determine where all the pieces belong. The turret handles and tow cable are not included in the kit. The builder is instructed to make these items from copper wire or, in the case of the tow cable, from thread or stranded wire. Instructions are a single sheet of folded paper with a parts layout and decal placement on one side with five exploded diagrams on the other. The drawings are crisply done and easy to read, though rather busy. Seven markings options are provided with all but one in overall khaki green. You get one Soviet, two Iraqi, one Northern Alliance Afghan, one Romanian, and one Croatian option. 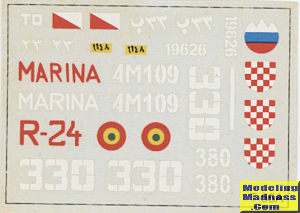 The small decal sheet is fairly well done and should be usable. I have seen Ace kits made into very nice models. This one has a lot of detail but will require some effort to get it properly built. I would not recommend this for a beginner, but if you have built short run kits in the past, you'll have no real trouble with this one.